On Sale Now! 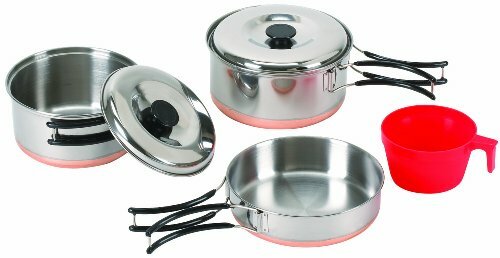 Save 8% on the Stansport 1-Person Stainless Steel Cook Set by Stansport at Kerinci. MPN: 361. Hurry! Limited time offer. Offer valid only while supplies last. Do you need a compact cooking set for your small home kitchen or camping stove? The Stansport 1-Person Stainless Steel Cook Set comes with an 8 oz. Do you need a compact cooking set for your small home kitchen or camping stove? The Stansport 1-Person Stainless Steel Cook Set comes with an 8 oz. plastic cup, 3/4 quart pot with lid, 1 quart pot with lid, 5-1/2" fry pan, and a nylon cover to pack the set. The pieces in this set have the capacity to cook a delicious meal suitable for a single person at home, or at the campground. The stainless steel cooking surfaces are lined with a copper bottom for an even heat distribution. Fold-away plastic handles allow for compact storage and stay cool to the touch while cooking. The Stansport 1-Person Stainless Steel Cook Set nests together for easy storage in the included nylon bag and will allow you to cook like a professional!